inform the budget and decision making relating to this important Waterfront Park. As part of the Master Plan process, architectural improvements are also being considered within the context of the park. These two projects were intended to run at the same time and to inform one another as each is developed in more detail. The Humber Bay Park Master Plan will establish a vision and design framework to protect and enhance the valued landscape, habitat and recreational uses of Humber Bay Park East and West for generations to come. 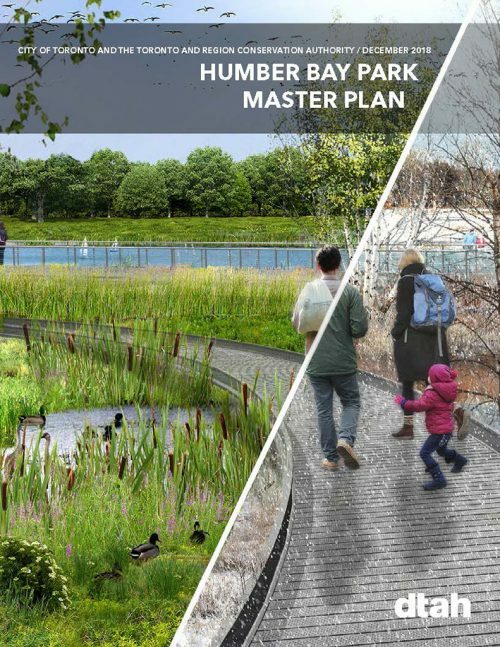 The Humber Bay Park Master Plan is a visioning tool, intended to establish a design framework for future park improvements, to help better define short and long-term goals for the park and to guide the implementation of projects and capital improvements for years to come. The plan will strive to ensure that ongoing state of good repair projects, future budget projections and capital projects continue to complement one another and build upon the vision for Humber Bay Park. The Master Plan is intended to be a living document that is to be updated and revised as the needs and vision for the park change over time. Ensures that proposed improvements respond to existing and future needs of the community and City residents. Inventory & Analysis – After an extensive review of background documentation, meetings with City staff, the TRCA, park operations and maintenance staff and a site inventory, a series of design principles and objectives were developed to support the vision for the Master Plan. Concepts & Alternatives – After an extensive review of background documentation, meetings with City staff, the TRCA, park operations and maintenance staff and a site inventory, a series of design principles and objectives were developed to support the vision for the Master Plan. Preliminary Master Plan – The preliminary Master Plan synthesized initial concepts into a that was presented to staff, public consultation as well as stakeholder and committee input for feedback and further refinement. Costing and Phasing – A high-level cost estimate was prepared for the implementation of the Master Plan. The cost estimate was divided into phases for possible implementation based on park user needs, opportunities for coordination with other improvement initiatives and funding availability. Final Master Plan – A preferred design concept for the Park was developed based on a synthesis of the draft explorations and in response to staff, public consultation as well as stakeholder and committee input. The document includes a summary of the site analysis, design principles and guidelines and sets out recommendations for proposed improvements that support the vision for the park that was established in the earlier stages of the project. The document has been structured to provide guidance to both the city and TRCA to address any changes that would be required to the Master Plan to ensure it remains relevant as the needs of the city and neighbouring communities evolve. Chapter 1 – Introduction: Provides and overview of the park context and history of the site and park development. This chapter also describes the Master Plan process and purpose. Chapter 2 – Background Analysis: Presents an existing site inventory summarizing existing challenges and areas of concern. Chapter 3 – Vision and Objectives: Establishes the vision, design objectives and proposed ‘big moves’ and key concepts of the Master Plan are described. Chapter 4 – The Master Plan: Shares the Illustrative Master Plan including both Humber Bay Park East and West. Chapter 5 – The Integrated Park: Provides a breakdown of the various areas within Humber Bay Park East and West describing the unique character of each area while highlighting their relationship to the larger whole. Chapter 6 – Park Components: Looks at the details relating to specific park components and how each component integrates with the larger context and vision for the park. Chapter 7 – Management Plan: Provides high level recommendations for park maintenance and operations. Chapter 8 – Implementation and Phasing: Provides and overview of implementation and makes recommendations for the improvements categorized as small, medium and large scale projects. Chapter 9 – Appendices: Relevant background and reference information that served the basis for the development of the Master Plan. To ensure the relevance of the Master Plan to the public and the local community, as well as the City and TRCA the design process included an extensive and interactive public consultation process. Public meetings were hosted through all stages of the project and open to members of the local community and city wide park users. Meetings were advertised on the City’s website as well as through flyers that were sent to residents in the neighbourhood. The public consultation process was comprised of a series of different approaches including Public Meetings, Community Resource Group Meetings, Pop-up events in the park, Stakeholder meetings and an on-line survey. Three public meetings were hosted to share information and gather feedback through the Master Plan process. The input from these sessions was used to establish immediate and long-term objectives for the park. The Community Resource Group (CRG) was established to provide input, guidance and advice during the design phase of the Project. CRG meetings were hosted in advance of each public meeting. The primary goal of the CRG was to represent the community, business groups and park/trail users and provide input to assist in the successful completion of the design phase of the Master Plan. Members of the CRG were selected through an open application process. The selection process was designed to include people who would represent the various interest groups and stakeholders in the Humber Bay Park area. Comments and suggestions about the content of the Master Plan were invited throughout the development of the Master Plan. Questionnaires were distributed at public meetings and surveys were available on the City’s project website, affording additional opportunities for input. A pop-up consultation was held on June 11, 2016, during the weekly farmers market. Preliminary principles and objectives for the Master Plan were displayed and visitors were advised of upcoming public meetings. Although the land occupied by the private boat clubs is not included in the scope of this Master Plan, a series of meetings were held with the clubs to understand their functional and operational requirements within the context of Humber Bay Park. An online survey was conducted related to park programming and proposed improvements. The preliminary results of the survey were presented in Public Meeting #3 and subsequently on the City’s website. In between CRG Meeting #4 and CRG Meeting #5 – the consultation process for the Architectural Project was initiated. This process included two additional public open house meetings and a series of 3 Architectural Community Resource Group Meetings (ACRG) organized to provide feedback and input to the Humber Bay Park East Building Project. The ACRG was made up of a separate group with members, selected through a similar open application process, with many members having a complimentary role with the Master Plan CRG group to provide continuity and consistency between both projects. The public consultation for the new building in Humber Bay Park East was conducted in coordination with the Master Plan, to ensure that the new building would be consistent with the guiding principles set out in the Master Plan. See Humber Bay Park Architectural project for more details. PFR and TRCA are working together to ensure that implementation will minimize impacts on habitat and ecology, and to promote a healthy diversity of riparian, terrestrial and avian environments. Works are scheduled for implementation in 2020-2021. The Architectural Community Resource Group (ACRG) was selected through an open application process. Applications were available at the September 29, 2016 Open House and were posted online. The selection process was designed to include 15-20 people representing various interest groups and stakeholders in the Humber Bay Park area. A terms-of-reference specific to this group was shared to ensure the ACRG members understand their roles and responsibilities. The ACRG represents the interests of the community, residents associations, businesses and park/trail users and provides input towards the development of a program and design features for the proposed building in Humber Bay Park East. Humber Bay Park is a destination park on Toronto’s western waterfront that was created through lake-filling during the 1970s and early 1980s. The parkland is owned by the Toronto and Region Conservation Authority (TRCA) and operated by the City. Over 43 hectares in size the park is defined by two separate large peninsulas, Humber Bay Park East and Humber Bay Park West, bisected by Mimico Creek. The park has been loved by the community for several decades and is now showing signs of wear, tear and deterioration.